IBM has launched the second instalment in the Urban Innovation web campaign, “In The City With”. The short documentary film series underscores IBMs continued commitment to transforming systems in cities, from education, public safety, transportation, health care, environmental and energy & water, to create Smarter Cities. From urban planning to haute cuisine, architecture to government, science, civic engagement, design, and urban farming, the web series explores a variety of disciplines in search of the most innovative and disruptive approaches to city life. The most recent episodes take us to London, where we meet the entrepreneurs behind civic crowd-funding site Spacehive and community engagement platform Changify; then to Copenhagen, where the Nordic Food Lab and Matt Orlando of Amass restaurant share their views on sustainability and the future of food culture. For Jonas Pedersen and Josh Evans, the future of food lies in marrying sustainability with “deliciousness.” As researchers at the Copenhagen-based Nordic Food Lab, they’re part of a team exploring how diverse, local and underutilized ingredients such as insects can help make cooking a force for change. According to Priya Prakash, the best place to start changing the world is your own neighborhood. Inspired by how technology and citizen action can work hand in hand to improve communities, she launched Changify, a London-based crowdsourcing platform aimed at finding local solutions to local problems. American Matthew Orlando is making waves in the culinary world. The former head chef at Copenhagen-based Noma, acclaimed as one of the world’s best restaurants, is now behind the oven at Amass, his own renowned Danish eatery. Yet for Orlando, it isn’t only rave reviews and a full dining room every night that define his success, it’s also about his commitment to a sustainable-food ideology. Chris Gourlay wants you to realize that you can make things happen. As founder and chief executive officer of Spacehive, a UK-based crowdfunding platform for civic projects, he should know. The organization helps people transform their communities by tapping into collective resources to help fund public urban-development projects. By knocking down barriers and shaking up community planning, Spacehive and Gourlay are ensuring that change can happen — and for the better. 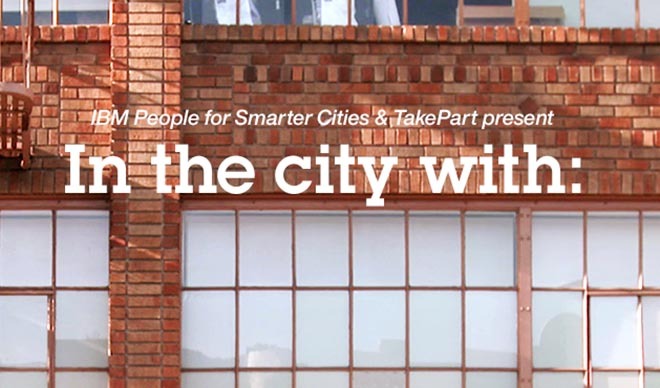 The “In the city with” web series airs on the IBM program platform people4smartercities.com where you can join the movement and share your idea to make lives in cities better. Discussions are happening now on facebook.com/p4scities and at @p4scities. “If we’re going to make our cities smarter, we have to promote the brightest urban innovations and the people behind them”, said Susan Westre, executive creative director for IBM at Ogilvy and the creative lead behind IBM’s new web series In The City With. The IBM In The City With campaign was developed at Ogilvy France, Paris, by executive creative director Susan Westre, art director Daniel Lincoln, copywriter Nick Bakshi, junior art director Elise Richardson, TV producer Diane de Bretteville, digital producer Ryan Leonard, media leads Darlene Lee, Michael Knopf, Sarah la Rocca, account leads Mary McFarland, Muriel Benitah and Sarka Guiomar working with IBM marketing team Jacelyn Swenson, Suzanne Assaf. Digital work was developed by Julie Teicher, Ian Crowley, Edward Szeto, Kinnari Thakker, Sanjay Cherubala. Filming was shot by directors Tomas Leach (all four of the latest series), Adam Rothlein and Jake Kornbluth with Moxie Pictures producer Lucy Tate. TakePart producers were Jay Ku and Scott Roesch.